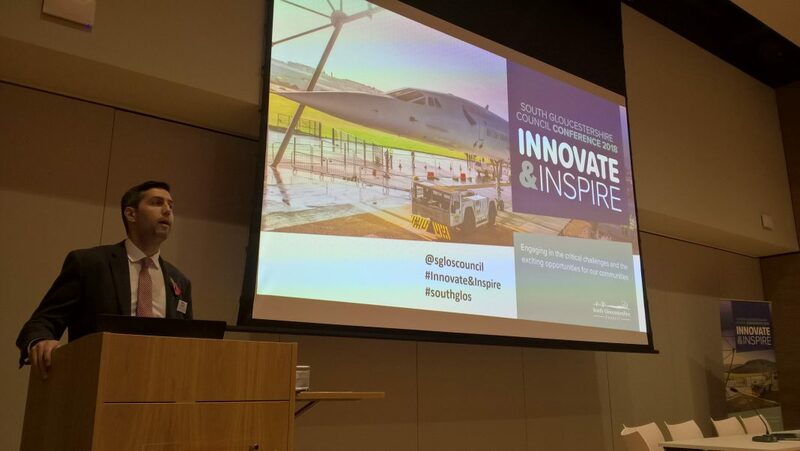 A range of partners and stakeholders from across the public, business, health and education sectors gathered at Aerospace Bristol on Friday for our Innovate & Inspire – South Gloucestershire Council Conference 2018. Delegates were given an insight and overview into our current work and key projects through keynote presentations from speakers including Cllr Toby Savage, South Gloucestershire Council’s Leader and Cabinet Member for Schools, Skills and Employment and Chief Executive Amanda Deeks. South Gloucestershire is increasingly a hotbed of innovation and a prime contributor to the West of England economy, particularly through the innovation corridor from Filton Enterprise Area, to the University West of England and the Bristol & Bath Science Park. The conference explored what makes for a successful place and offered the opportunity for stakeholder engagement and discussions on the critical challenges and exciting opportunities for our communities going forward based on the ‘Innovate & Inspire’ theme. Key topics covered included the delivery of innovative and imaginative new homes, notably the Cribbs Patchway New Neighbourhood, the revitalisation of some of our less affluent urban centres and how we provide for healthy environments and lifestyles alongside co-operation in delivering positive mental health for our communities. The challenge to inspire the next generation and provide opportunities for employment for all people in our communities was also explored through the event. Education, infrastructure, health and businesses partners were able to interact in panel sessions covering topics including ‘A New Approach to Urban Living’, ‘Enhancing Post-16 Outcomes’ and ‘Inspiring Careers’. This panel approach facilitated rigorous challenge and engagement, which will contribute to critical forthcoming strategic priorities such as the Education Plan, the new Local Plan, the Council Plan and exciting projects such as the recently announced ‘Love our High Streets’ project emerging from the West of England Combined Authority. Cllr Savage said: “I am delighted to have had so many Council partners under one roof at the Conference, showcasing the fantastic work being done to improve South Gloucestershire as a place people want to live and work.